Each time slot is about 10 minutes long. Contact utariseacappella@gmail.com for more information. 45-seconds to 1-minute of any song of your choice. This song should show off your range, musicality and any other vocal talents you may have. You may sing any genre of music, regardless of whether we normally sing it or not, preferably pop and R&B. If you are able to beatbox, let us know and show us your stuff! Sing 4 scales within your range. Tonal Memory – See a piece of sheet music and have the short melody played twice; you sing it back the third time. Ear training – note combinations are played; you sing them back the second time. You will be notified by both phone or email if you make it to our callbacks! Rehearsals are usually Mondays and Thursdays from 7:00 - 9:00 PM in the Music Building. During competition seasons, we may have up to 3 rehearsals a week. We have a lot of fun during these rehearsals since we are such a social group, but we also stay motivated and productive! The commitment level is high but it does not prohibit you from doing other activities and focusing on your studies. We are the only A Cappella group at UTA currently and we have 13 members. In the Fall semester, we usually start learning our new sound after auditions and learn new rep for the upcoming Falliday concert. We usually prepare an audition video for the International Championship of Collegiate A Cappella (ICCA’s). 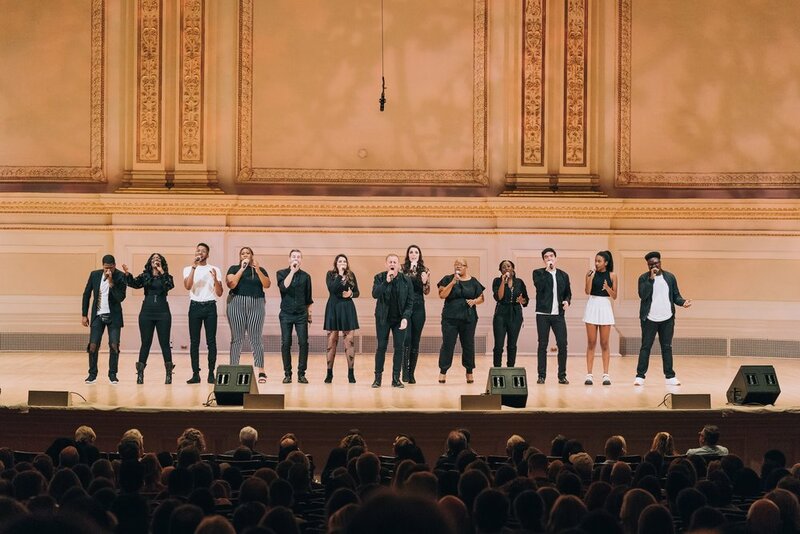 The Spring semester is our competition season for the ICCA’s and other well known A Cappella competitions.